The health benefits of garlic are one reason it has gained in popularity as a spice. Cooking chicken with garlic gives you protein with a heart-healthy flavor. 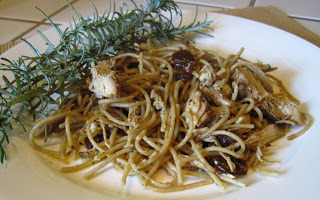 This recipe combines garlic chicken with whole wheat pasta and sun dried tomatoes. I can remember as a child, we would have a designated spaghetti night and the family would sit around the table and enjoy great conversation over a fabulous meal. When I want to take a trip back in time, I prepare a spaghetti night with a Stay Healthy twist: garlic chicken with whole wheat pasta. For this recipe, I use 100% whole wheat pasta and grilled chicken breast. Because they add a special compliment to the entire burst of combined flavors, I add sun dried tomatoes. Finally, this dish can be prepared in the time it takes to cook the noodles. That means it’s on the table to enjoy in less than 30 minutes! Cook the pasta according to box directions and for the serving size you desire. Drain and place into a large pasta serving bowl. The sauce is prepared at the same time as the pasta. In a large saute pan, heat 1/3 cup extra virgin olive oil over medium heat, careful not to get too hot. The point is to heat or warm the oil. Add the garlic minced equal to 4 cloves and saute until fragrant. Do not burn. Add 5 or 6 fresh chopped basil leaves and continue to stir. Add the red pepper flakes to taste and saute for 1 minute. Chop the prepared chicken breast and sun dried tomatoes and place in the the serving bowl along with the pasta. Pour warm sauce over pasta chicken and gently toss until well coated. Sprinkle with Parmesan cheese if desired.